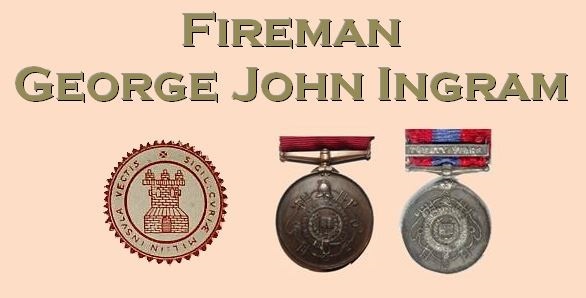 Fireman George John Ingram of Ryde Fire Brigade passed away on 28 November 1911 aged 51. George was the son of Maria, born in 1860 and christened on 21 September that year. No evidence has been located on his father's name and the Census return of a year later lists him as a baby living at an address in Hill Street with his mother, 11 year old brother James and 7 year old sister Nancy. In the following Census, by now just 12 years old, he was living without any of his family as is listed as a boarder at an address in Albert Street where the head of the household was the widow and washerwoman Fanny Wheeler who shared the house with her 20 year old daughter Harriet. In 1881 the Census finds him at another address in Albert Street, by this time a lodger of the house under Elizabeth Allen. George's occupation appears to state navvy. Ten years later he was still lodging in Albert Street at a third address, this time under the head of the household general labourer George Corney and his wife Mary. George, by then 30, was working as a pipe layer. Given that George received an NFBU 20 year long service medal in 1903, it can be assumed that he joined Ryde Fire Brigade by at least 1883. Although his mentions in the Press list him as a fireman of no rank he was clearly a dependable chap as Captain Langdon left him in charge while he was away in January 1894 and by chance he was left commanding the brigade at a serious fire at Stone Pitts, the home of Miss Brigstocke on the 3rd. Whether or not he was a regular sportsman isn't known but he kept a clean sheet when playing in goal for Ryde's brigade against the Police on 6 January 1898; the firemen eventually winning the fixture 5-0. The 1901 Census reveals that George married Annie Womack (of Farnham) at some stage since the previous census. They lived at 1 Enmore Villas, Park Road, and shared their home with their four-month old son Harold and one George Holden who was Annie's brother. George's occupation is given as plumber and turncock. Throughout several decades of this era various Press reports of Ryde's endeavours remark on the town turncock with regard to water supplies at fires. On one occasion the suggestion was made that the turncock, with his knowledge of the mains and valves, should be a member of the brigade and responsible for training the other firemen in the appropriate use of mains water. Given that George was previously working as a pipe-layer and that he worked for the town's corporation for 28 years, his knowledge of the system becomes apparent. The family, minus the brother-in-law, remained at the same address when the 1911 census was taken but sadly George passed away less than three months later. His funeral service was held at the Holy Trinity in Dover Street three days later where twelve members of the brigade attended under First Officer Robert White. Rest in peace Fireman Ingram.